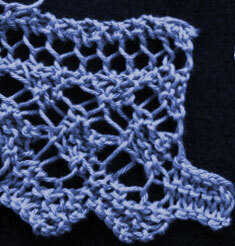 I decided to do another vintage lace edging this week. I have seen "French Lace" stitch patterns several times in the old books and newspapers, and this is the one I chose this time. This appeared in the March 19, 1882 New-York Daily Tribune and was submitted by Emma Estelle Wetsel.